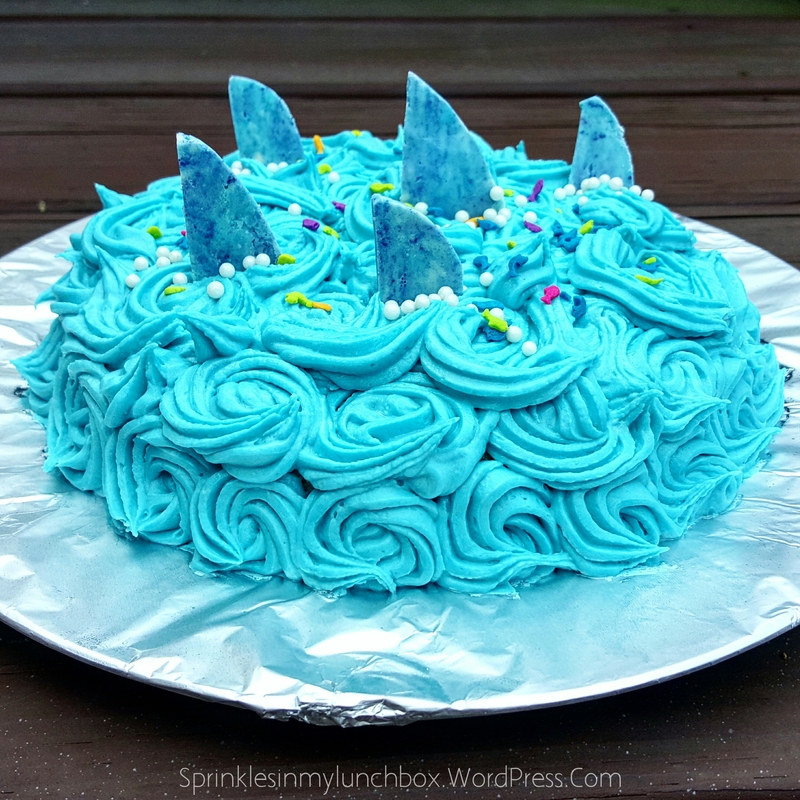 I had so much fun making this shark cake. 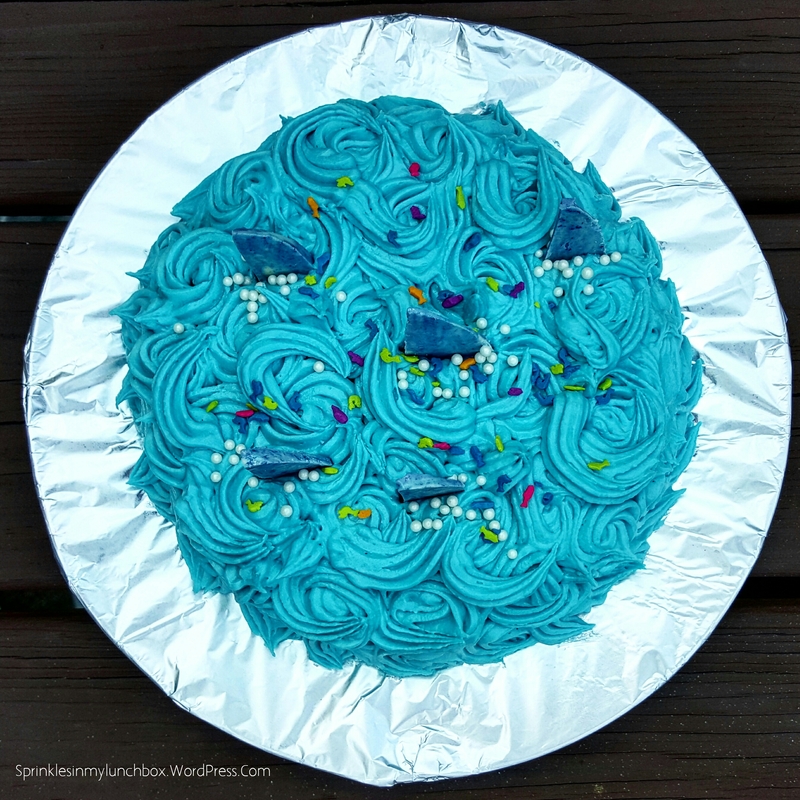 Honestly, I have fun making any cake, but this one was especially fun for me. Cake. Icing. Sharks. Cake. Sprinkles. Icing. Cake. Sharks. I made a one-layer (soooo, basically no layer(s)? not sure, too meta for me) vanilla almond cake, with a creamy, vanilla almond frosting. 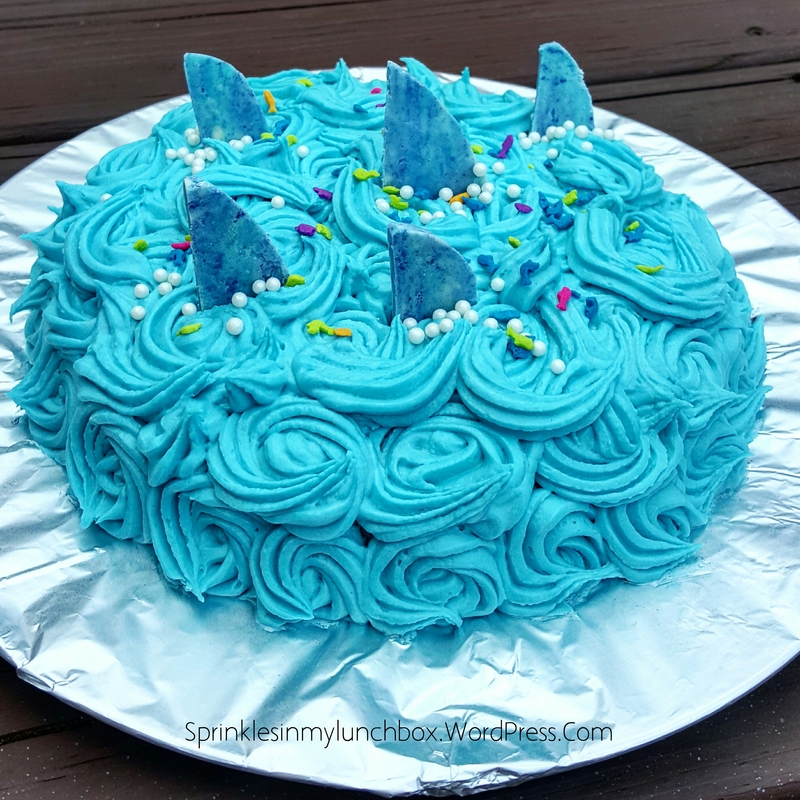 I used the I Am Baker method of swirling the frosting into rosettes and added some extra “waves”. 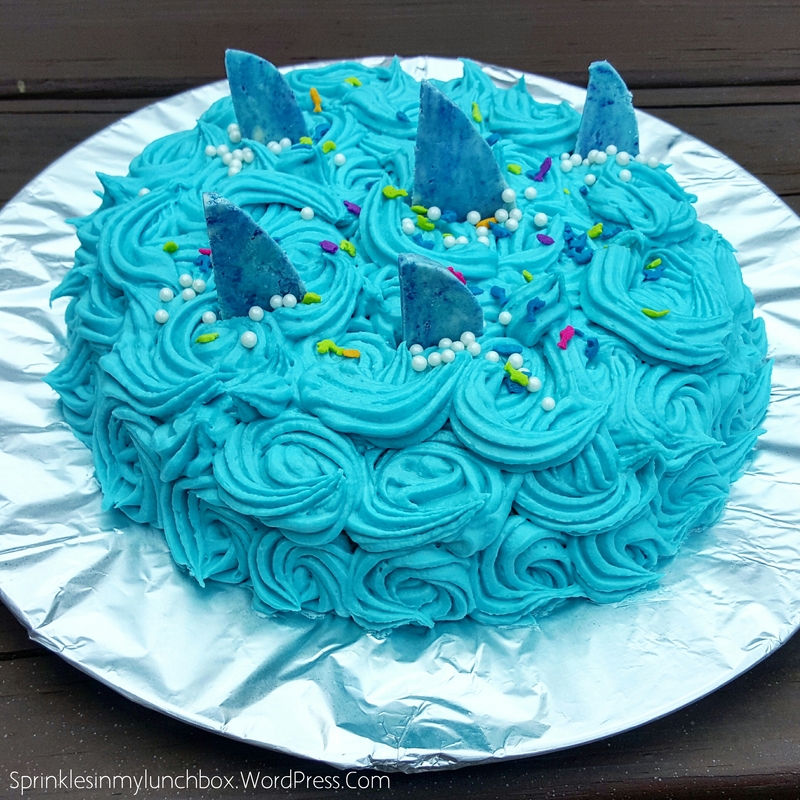 I made blue toned white chocolate shark fins, used white pearl sprinkles for bubbles, and used dolphin and fish sprinkles. Preheat your oven to 350F. Grease one 8-in cake pan and set aside. Combine the dry ingredients in a large mixing bowl. Whisk together the wet ingredients in a smaller mixing bowl. Pour the wet ingredients into the dry ingredients and mix until just combined. Add sprinkles (I used green and blue) and mix together. Pour into prepared cake pan. Bake for about 30 – 35 minutes or until the center of the cake springs back when touched (mine took 30). Cool the cake for 10 minutes before letting it cool on a wire rack. Beat the butter in bowl of stand mixer on medium to high speed until light and fluffy, for about 3 minutes. Add the vanilla and almond extracts. Turn the mixer to low speed to slowly add in the icing sugar. Whip for at least 6 minutes on medium high. Add food coloring and mix until fully integrated. Add more milk to the frosting, if too thick. Add more icing sugar, if too thin. Place a sheet of parchment paper over a pan. Melt white chocolate chips on the top of a double boiler (microwave will also work, I just find a double boiler more consistent). Whisk until smooth. 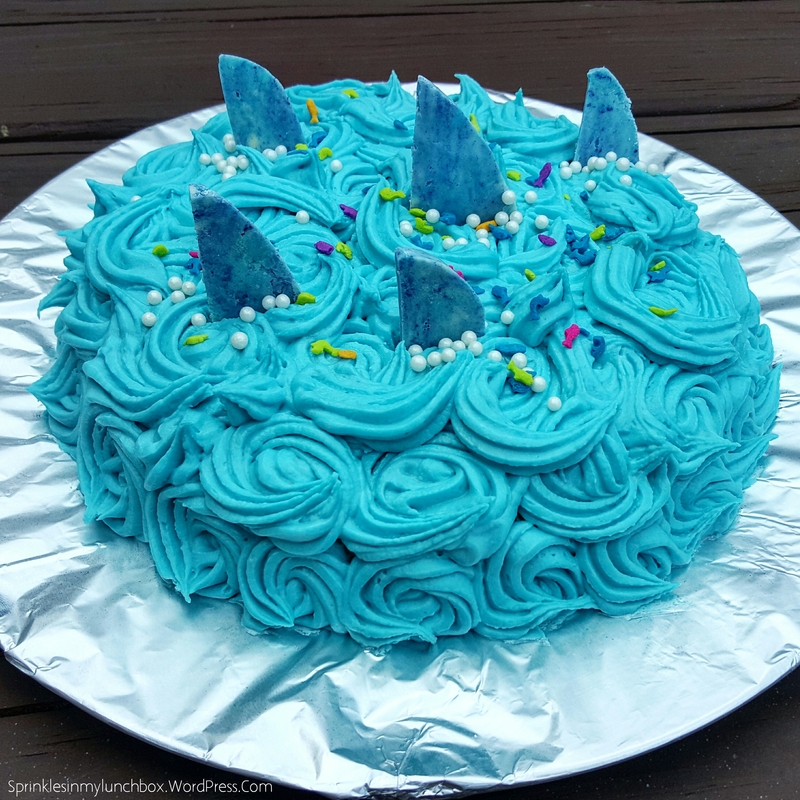 Add a few drops of food coloring and whisk again. Once smooth, spread out onto the parchment paper. Place in the fridge until hardened. Once it is, use a very sharp knife to cut shark fin shapes. Place the one-layer cake onto your serving platter. 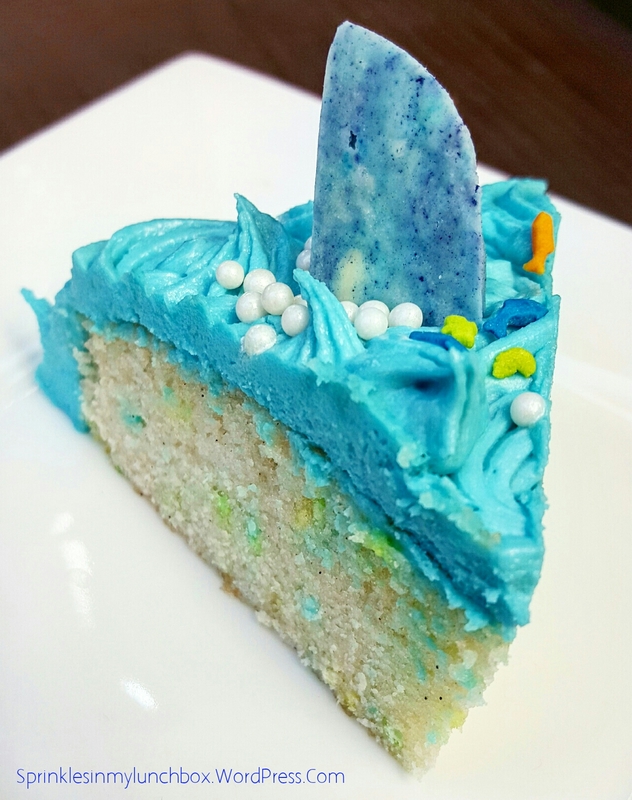 Scoop the blue frosting into a piping bag, fitted with a 1M tip. I didn’t need a coupler. 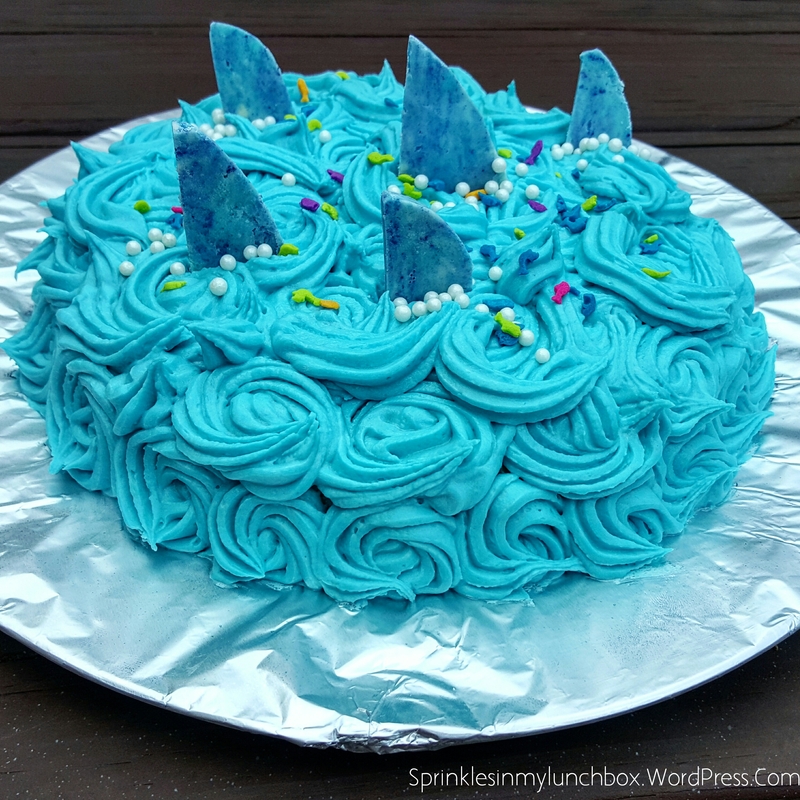 Make frosting rosettes all over the cake. 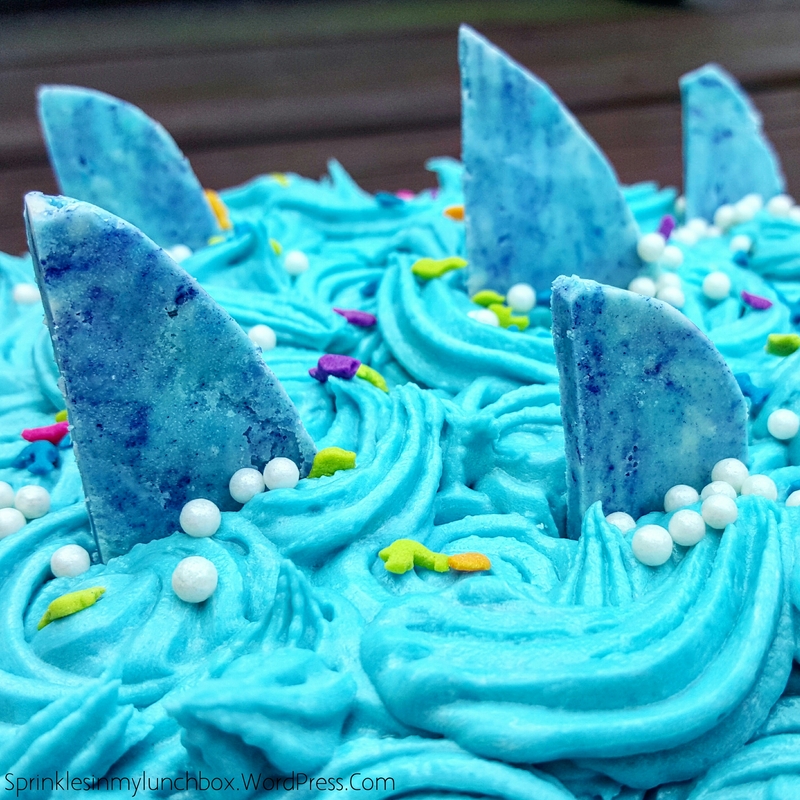 Once it is covered, go back and add a few flicks of frosting, for “waves”. 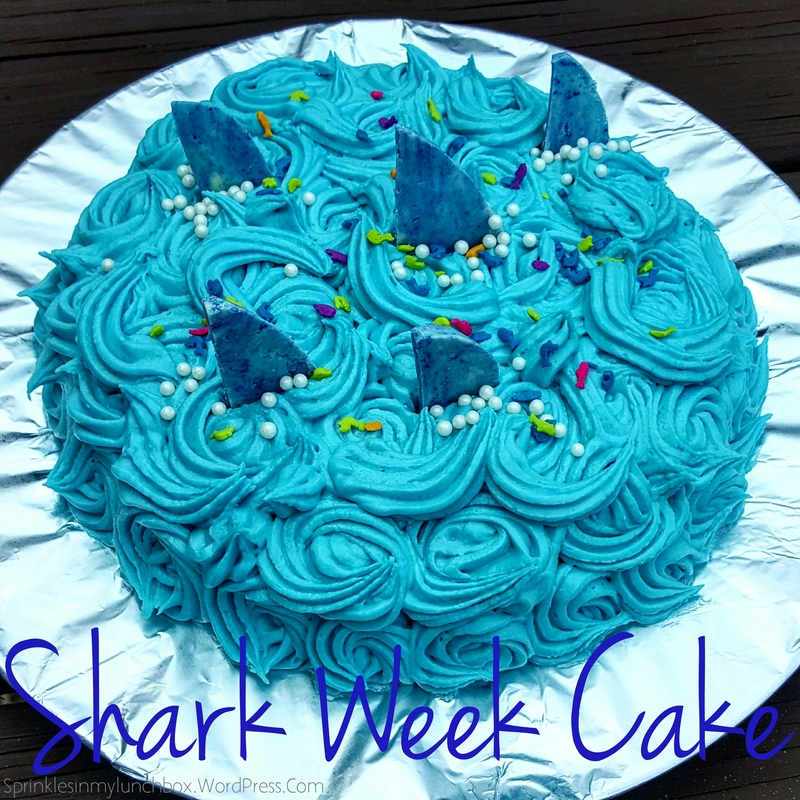 Stick white chocolate shark fins into icing, add a few pearl sprinkles around it, as “bubbles” and sprinkle the entire cake with fish and dolphin sprinkles. El fin. <– get it?